The years following the American Civil War propelled the great state of Texas into a bold future through a rush of expansionism. Much of this industrious activity was made possible by the ever-increasing reach of the railroads and, in Texas, great stretches of track were laid down and paid for with the lives of prisoners having little hope of ever escaping the state penal system. Ruby's Prayer is the story of the Texas-based Wallace family during the spring of 1880. The family is recovering from the wounds of the Civil War, including the loss of their mother, son Tom Wallace's inhuman incarceration, and sibling rivalries and double-dealings, all while enmeshed in the intrigues of political, monetary and personal ambitions. 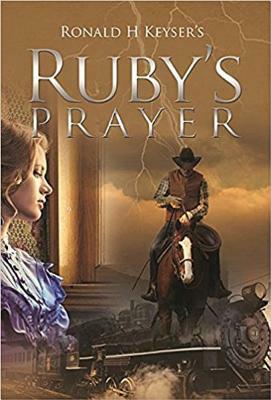 Full of colorful characters both likable and despicable, Ruby's Prayer reveals the hopes, loves and trials of an American family struggling to find their way during the tumultuous emergence of the Industrial Age and the final days of the Wild West. Ron Keyser was born in Marshall, Texas on September 24, 1957. By the time he was eleven years old, his family had moved to several different cities, including Tyler, College Station, Dallas, Overland Park, Kansas, Richardson, Austin, San Antonio and finally Houston. His father was a debit agent in the insurance business and did an amazing job of supporting a family by himself, but his quest to make more money dragged their family around the state of Texas for a number of years. He didn’t start writing until he was in his late forties, but throughout his life he always enjoyed reading and believed one day he could write a book. It would never have happened, however, if it wasn’t for his wife, Lori. When he told her he had the idea for the story bouncing around in his head, without hesitation, Lori told Ron he should write it down. From that day forward, they dove into the project full speed. As Texas history buffs, they took many trips to Huntsville, Texas to visit the prison museum, tour the town and try to get their hands on anything that would help them get a feel for what Huntsville and the townspeople were like in 1880. They took a trip to Belton and stayed in the Morning Glory Inn, now a bed and breakfast that was built in 1875 and was the inspiration for Turner Bell’s home in Ruby’s Prayer. They also took time to visit the Bell County Museum and the Temple Railroad Museum in Temple. Ruby’s Prayer is Ron’s first book, but he has several projects in the works and looks forward to seeing them in print.